We had to motor through the night in light winds from about 8:00 at night till 0800 this morning. 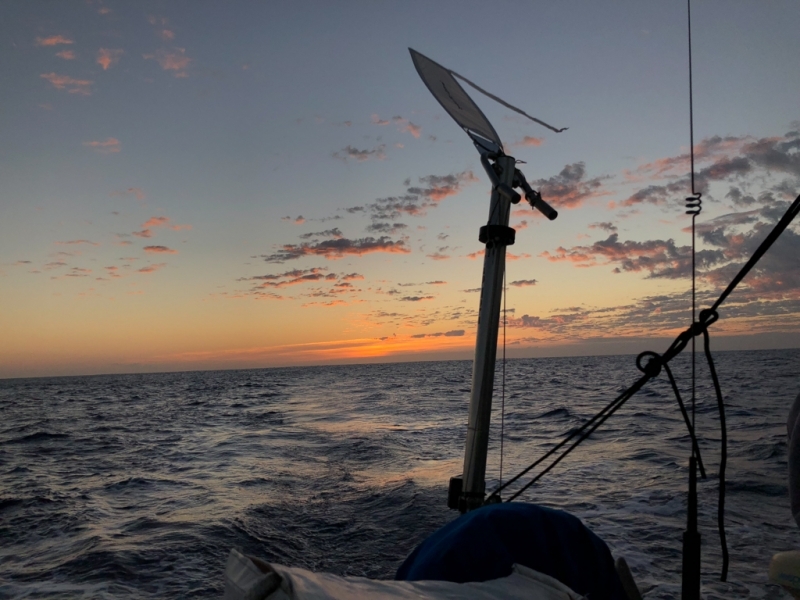 We are hoping that this doesn’t happen often on this passage, because the only thing we are rationed on is fuel, as Aiki left Mexico with about 100 gallons. 50 gallons are in internal tanks, and 50 gallons are strapped to the deck in jerry jugs. The seas decreased throughout the night along with the falling wind, making the motion comfortable. Sometime in the night the second reef line chafed through. It all seemed fine in the before dark chafe check. (There are two chafe checks a day, one just before dark, and the other the first thing in the morning.) Cormac found the sail baggy on his watch and went forward to tighten the reef line, which unfortunately pulled the internal reef line out of the boom. Any one of us would have done the same, so there is no blame attached, just we now have no way to use the boom internal reef line until we get to port and remove the end of the boom and rereeve it. We rigged up an external reef line for the second reef using some dyneema softies and some extra blocks we keep aboard for any type of issue that might come up. It is working without any issues so far. This repair took about 2 hours out here at sea; it would have taken all of 20 minutes to do if we were in port. Breakfast was scrambled eggs for the egg eaters, and cereal for Cormac and Guy. 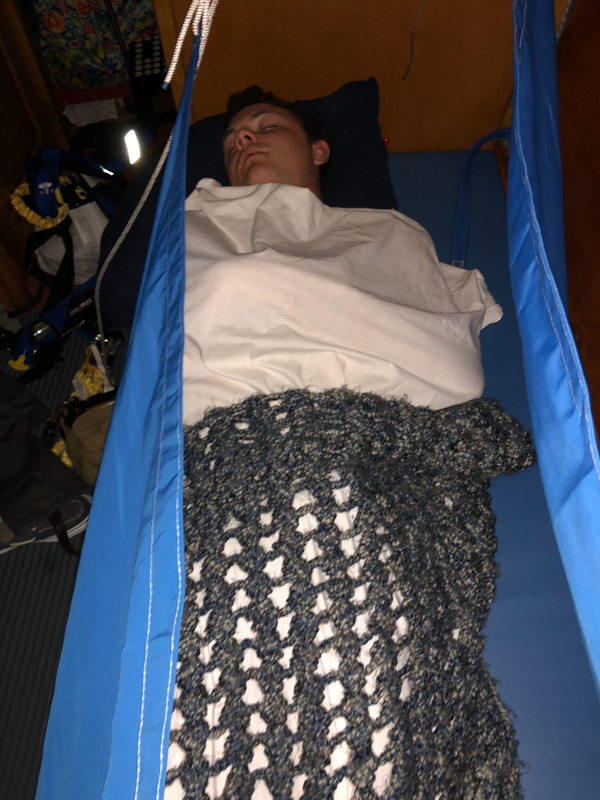 Guy managed to get some good quality sleep for the first time on the passage, and was consequently much cheerier in the morning. Everyone else is settling into their sea legs nicely, and the crew is having fun, and in light spirits. Yesterday we sailed thorough an entire pod of dolphins. There were more than 60 of them and they were very actively playing with each other, the waves, and the boat. It was very entertaining. Also sighted were numerous flying fish, both singly and in schools jumping from one swell to the next. Blue footed boobies and frigate birds rounded out the wildlife sightings yesterday. Today we have only seen some flying fish, and the occasional unidentifiable bird. In preparing for lunch we found that 4 bags of our “good until may 12th” tortillas had completely gone off, and had to be discarded. We carried on with the more standard grocery tortillas and had bean and cheese quesadillas for lunch. 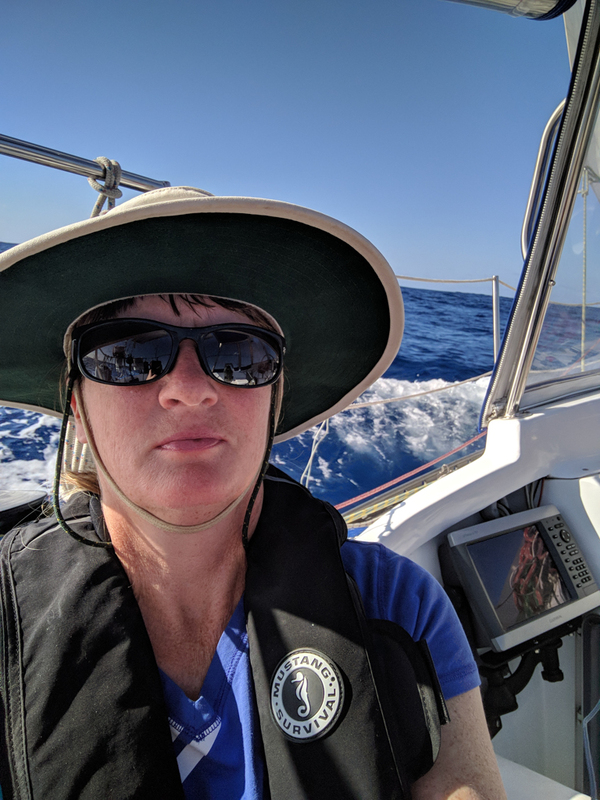 We were able to speak to Jade Akka on the vhf today; they seem to be about 120 miles or so behind us making a little more west than we are. On board are Thomas and Isabella from Switzerland. 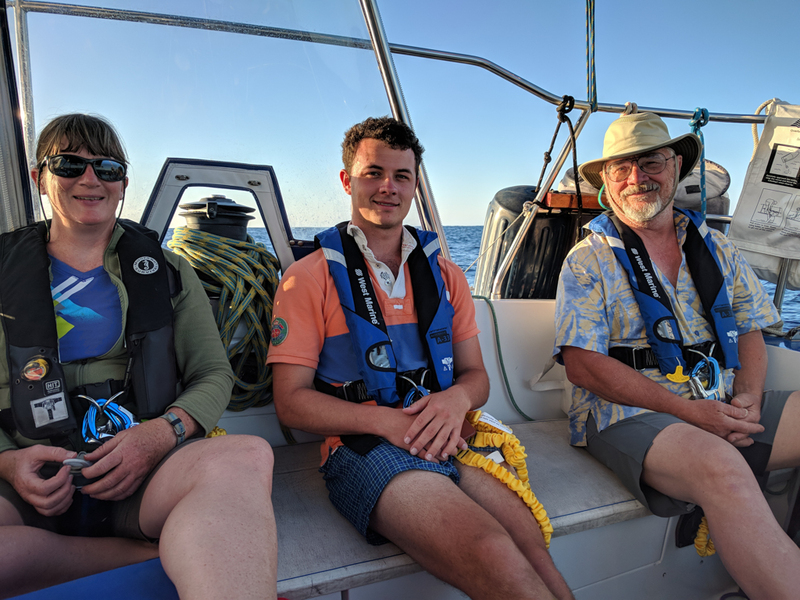 While we were talking we discovered another boat out here with us, a French boat named Aramik with Jacques, Pierre, and Nicole aboard headed to Hawaii, and then Sitka, Alaska. Then they will sail down the west coast of the US and Mexico and cross to French Polynesia next year. They have been out of Panama over three weeks, and are looking at another three weeks to get to Hawaii. Shipping traffic has died off, with lots less boats on the AIS and a lot fewer panga fisherman trying to entertain themselves by making animal noises on the radio all night. 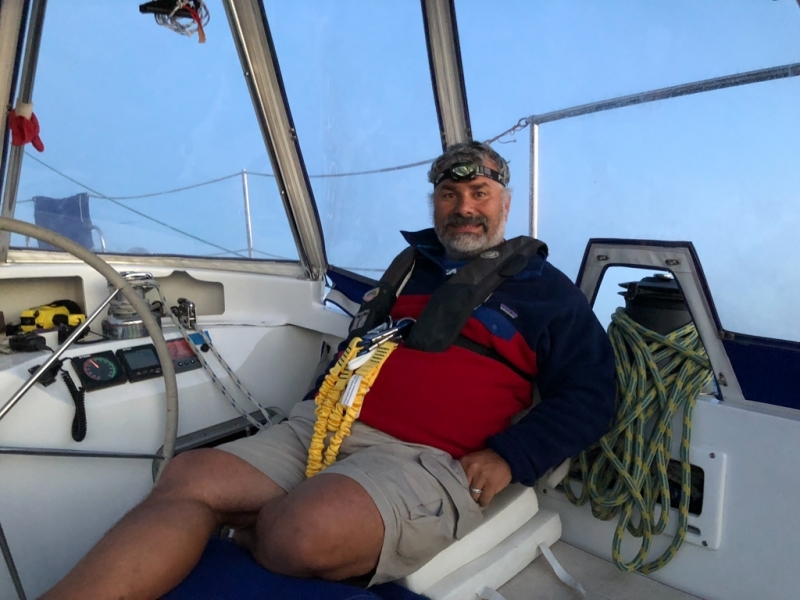 Our friend Jay reports that there is another boat with friends of his aboard that are only about 60 miles ahead of us, and that we are gaining on them. We tried to raise them on the VHF but have not been able to yet. Rand reports the crew is enjoying themselves, is in high spirits, and that Cormac is wearing shoes for 6 hours a day. We are settling in for night watches now.